Inspired by the writings of Franz Kafka and the work of artists H.R. Giger and Pierre Matter, Gaby Wormann is an artist who, in her own words, “deals with the themes of individual ethics and humanity’s uninhibited intervention in complex biological systems”. Wormann’s mind-boggling creations, which she calls “MeCre” (short for “Mechanical Creatures”) demonstrate a rare dexterity and represent her futuristic vision of the evolution of insects: New, hybrid lifeforms – organisms fused with mechanics – that are more resistant, more efficient and more technically optimised. 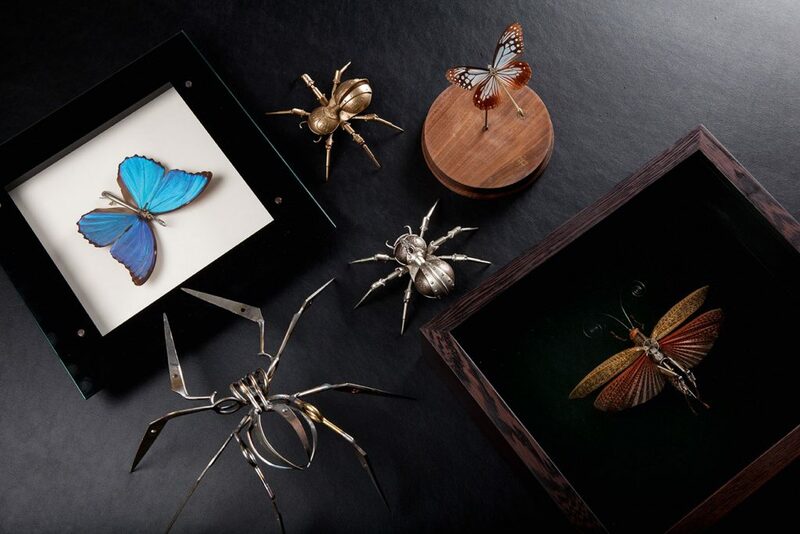 The result is a series of bionic insects that appear eerily real. If the sight of a regular tarantula wolf spider isn’t arresting enough for you, then Wormann’s Lycosa tarantula – with mechanised body and mechanically enhanced legs – takes this arachnid to a whole new level of exoticism. Likewise, her Megasoma actaeon possesses impressive layers of mechanical gears endowing this large-winged rhinoceros beetle with even more three-dimensionality than Mother Nature provided, while Wormann’s Tropidacris dux is a Giant Brown Cricket with elegant, super-sized mainspring-enhanced antennae.